through Canara Bank Probationary Exam. Online application for this Canara Bank will be available from 23-11-2018 and last date for applying online is 13-11-2018. Candidates selection will be through Written Exam, Group Discussion and Interview. Course duration is 9 months classroom and 3 months internship at Canara bank. Online test for this Canara Bank PO jobs will be held on 23-12-2018. 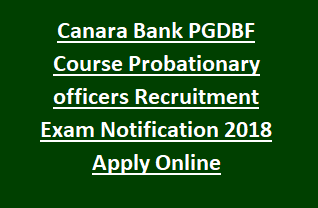 More information about this Probationary Officer Vacancy exam notification of Canara Bank is given below. Category wise posts are given below. Candidates who joined as PO will receive month salary under pay scale of JMGS-I "23700 – 980/7 – 30560 – 1145/2 – 32850 – 1310/7 – 42020"
Candidates selection will be through Written exam, Group Discussion and interview. Written Exam will be conducted for 200 marks. Total 200 questions will be given each question carries one mark. Exam duration is 2 hours. Interested candidate can apply online through IBPS Recruitment link. Last date for applying online is 13-11-2018. Written exam admit cards will available in the same link from 05-12-2018. Exam will be conducted on 23-12-2018.